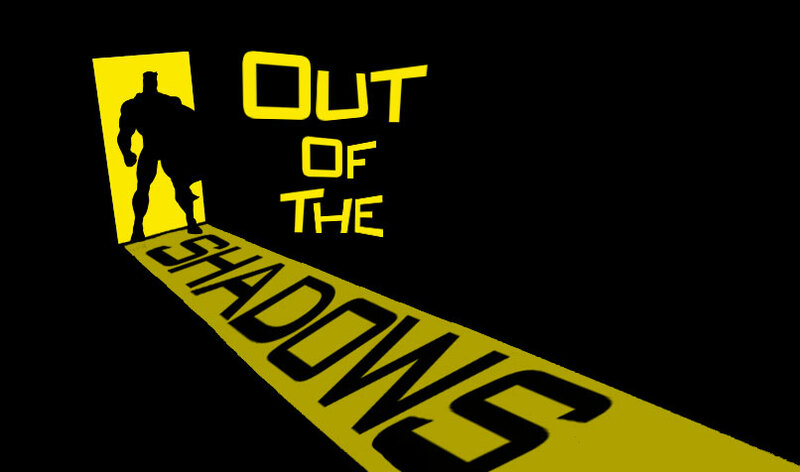 Out of the Shadows… is a series of articles highlighting fun, helpful cards that aren’t getting a lot of attention. They may or may not be meta-worthy, but are definitely worth looking at for casual play. Kree Soldier: Stagnant Evolution is a character from the Kree Invasion Team Pack. There are 3 versions of this character in the pack, and all are 2 cost fist characters. His ability makes him a hidden gem. 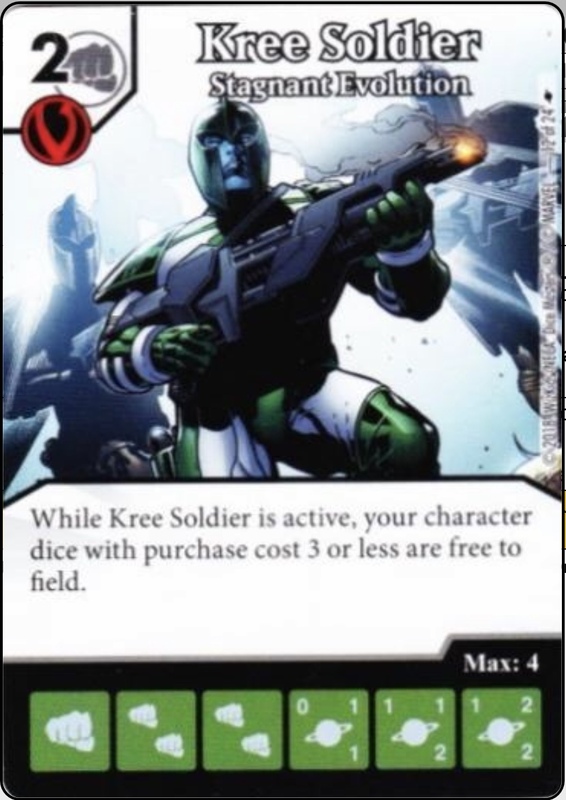 While Kree Soldier is active, your character dice with purchase cost 3 or less are free to field. Note that the only qualifiers of his ability are that Kree Soldier is active and the purchase cost of the character being fielded. When I’ve seen these types of abilities before, they usually specify an affiliation, but this Kree doesn’t discriminate. Have you ever had to chose between fielding a character and buying something you need to support/protect your win-con? If your team contains cheap but effective folks, this is the card you’re looking for. Many of the top cards right now cost 3 or less, but have a fielding cost on one or more levels, and in some cases, that fielding cost is 2 (ouch!) Even if the fielding cost is only 1, with this Kree in your field, you’re saving that energy for a Global Ability or using it to buy something else you need to try to win the game. He’s soldiering on and he’s carrying your team on his back. Imagine being able to field Shriek: Sonic Beam (SMC) for free on EVERY level to blank those pesky opposing cards. Jubilee: Mallrat (XFC), Boom Boom: Time Bomb (XFC), Ork Nob: Big Choppa (ORK), and Parasite: Maxwell Jensen (JUS) become much more pallatable, just to name a few. Take a look at your teams and the cards in your collection, and you’ll see just how effective this Kree can be. Let’s take a minute here to see what could happen if you subbed our Kree Solider into an interaction that’s seeing a lot of play online and on some competitive teams. You may have heard some chatter about the Global Ability on Clayface: Restless (JUS), being paired with Poxwalker: Curse of the Walking Pox (BFU), and Kree Captain (KI) – any version, but usually the one subtitled Lost Purpose. When these three cards interact together, they do something pretty special. For those that haven’t seen this interaction yet, here’s a quick explanation. Global: Pay mask. Once per turn, you may take a die from your Used Pile and add it to your reserve pool on any energy face. Global Ability: Pay 2 fists. Once per turn, the next character die you purchase this turn costs 3 less (minimum 1). Clayface and Kree Captain are on many teams primarily for their Global Abilities. Clayface lets you exchange one energy for two (or a different one, for example, if you have a mask, and need a bolt). 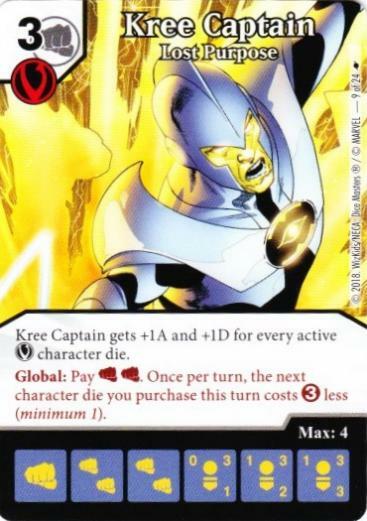 Kree Captain allows you to purchase a higher cost character for three less energy, making higher cost win-cons more viable and easier to purchase earlier in the game. Poxwalker: Curse of the Walking Pox is on teams to ensure you get the two fists you need to use the Global Ability on Kree Captain. You can purchase this Poxwalker for 1 fist and then use a mask and Clayface’s Global Ability to bring it in on it’s double energy face. This provides you instant and guaranteed energy for the Kree Captain Global Ability. 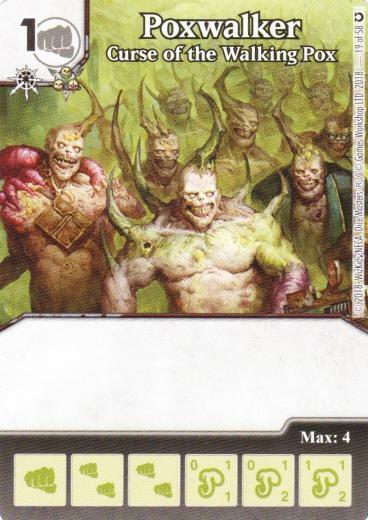 But once you’ve bought your high cost character by using the Poxwalker die and the Kree Captain Global, you have this Poxwalker rolling around in your bag. Maybe he’ll give you fists…maybe he’ll roll on level 3 all game, and you can choose between paying 1 to field him for a blocker, or sending him straight to the Used Pile. If you choose to use our Kree Soldier in place of the Poxwalker, you could have a die in your bag that actually helps you when you field it. Even though your win-con is a high cost, your support pieces are likely 3 cost or less, and fielding those pieces for free will be pretty sweet. Have you used this Kree Soldier on any of your teams? How did he affect your gameplay? Did it annoy your opponent that you didn’t have to pay to field your characters? We’d love to hear from you, let us know in the comments. Great article!! I been having a lot of fun with this card. Thanks Michael! It is a fun card to use. Makes some teams so much easier to pilot! Excellent article! Welcome to the team! I have had so much fun using this card building teams from the Amazing Spider-Man set. ASM has the worst fielding costs, but a number of 3 cost cards had really great A&D stats. But when the TFC was 5 or 6, they weren’t all that viable. Love being able to revisit older, mostly forgotten cards. Glad you’re enjoying this card too, Noah! That’s one of the things I love about this game, how you can add new cards to the old to make them more effective, and vice versa.